After the onset of Monsoon, Delhi NCR has been witnessing good Monsoon rains. These showers have also arrested rise in mercury, which has been almost settling below or near the normal levels. The major rainfall occasions were marked on June 28 and July 2, when moderate rainfall activity was recorded over parts of Delhi-NCR region. During the last 24 hours also, light showers were observed over the capital city with few moderate spells in the nearby regions of Gurugram, Faridabad, Noida and Ghaziabad. 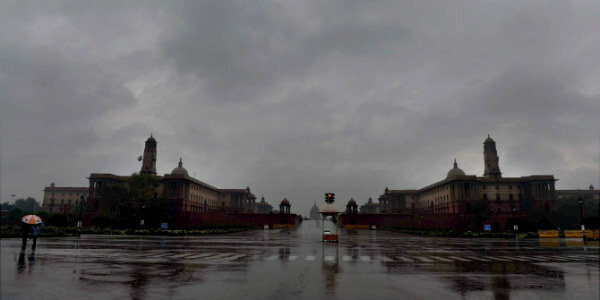 In the last 24 hours from 08:30 am on Tuesday, Delhi’s Safdarjung observatory recorded 5.1 mm of rain followed by, Ridge observatory at 6.4 mm and Palam observatory at 1.2 mm. Moreover, the city saw few light showers today morning as well. In fact, Delhi stands a chance of rain today and tomorrow as well during the late evening and early morning hours. Even though during the next 24 hours, the intensity of rain will be mostly light. Thereafter, for the coming days, the weather over Delhi-NCR is expected to remain dry, and ultimately a rise in day temperatures will be observed. Thus, maximum temperatures may rise and settle in high 30s. Rains are likely to make a comeback over the city around July 9. The normal average for Delhi during the first half of July generally settles around 36˚C and minimum around 27˚C. On Tuesday, Palam observatory recorded its maximum temperature at 36.4˚C, Safdarjung observatory recorded its day temperature at 36.7°C. Ayanagar and Ridge also recorded their maximum temperatures at 35.5°C and 35°C, respectively. Thus, we can say last few days have been witnessing normal day and night temperatures.